TSKgel SuperAW columns are used for high efficiency and high speed analysis of polymers that are soluble in polar organic solvents. Examples include cleansing gel in methanol, degree of saponification of polyvinylalcohol in HFIP, and sodium dodecylsulfate, polyimide, and cellulose derivatives in DMF with 10 mmol/L LiBr. TSKgel SuperAW columns contain highly crosslinked hydroxylated polymethacrylate particles which minimize swelling in polar organic solvents. For high throughput applications, the smaller dimensions of the TSKgel SuperAW columns provide equivalent resolution in half the time and with minimal solvent waste compared to the TSKgel Alpha columns. They are ideally used with EcoSEC GPC systems which are optimized for semi-micro SEC/GPC applications. The mixed bed column, TSKgel SuperAWM-H, has an extended linear calibration range, and is suitable for samples with a broad molar mass (MM) distribution as well as samples with unknown molecular mass. Unlike TSKgel PW-type columns, which are stable at most to a 50% organic mixed with water, TSKgel SuperAW columns offer excellent stability in 100% aqueous to 100% organic solvents. 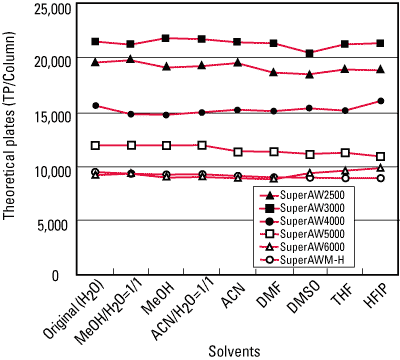 As shown in the figure below, efficiency of all TSKgel SuperAW columns is maintained when changing solvents from water via acetonitrile, DMF, DMSO, THF to HFIP.